For insights into these “gateway drugs” check out this post. 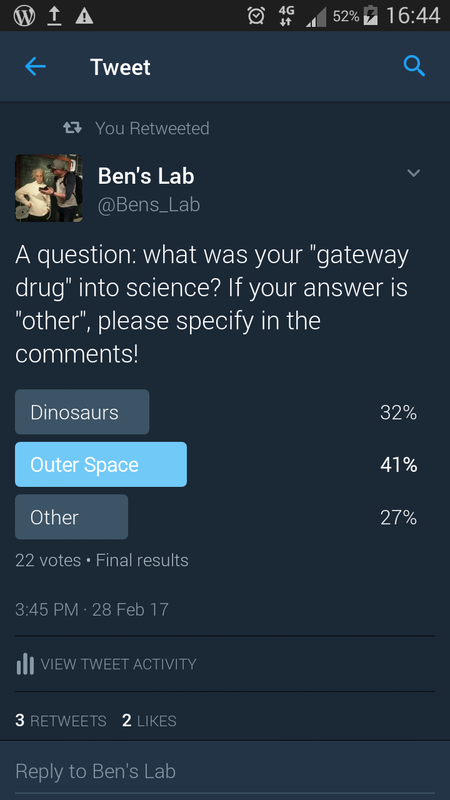 This post will take us on a joyful (and maybe self indulgent) look at my own gateway drug: dinosaurs. 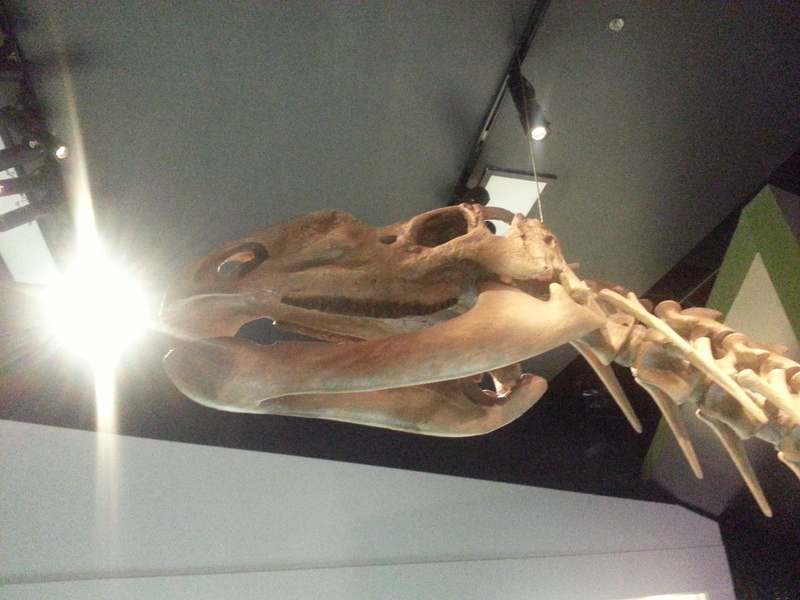 A very recent visit to the Melbourne Museum had me making a bee line for the dinosaur and fossil exhibits. Even now, in my forties these fascinating relics of the bygone age to top all bygone ages have a powerful hold over me. “It’s a warm afternoon, somewhere in mid Cretaceous Queensland, Australia. A small group of hadrosaurids are approaching a shallow river with caution. For miles in all directions a tangled patchwork of marshland and conifer forest is home to communities of dinosaurs who have made this delta their home for countless generations. 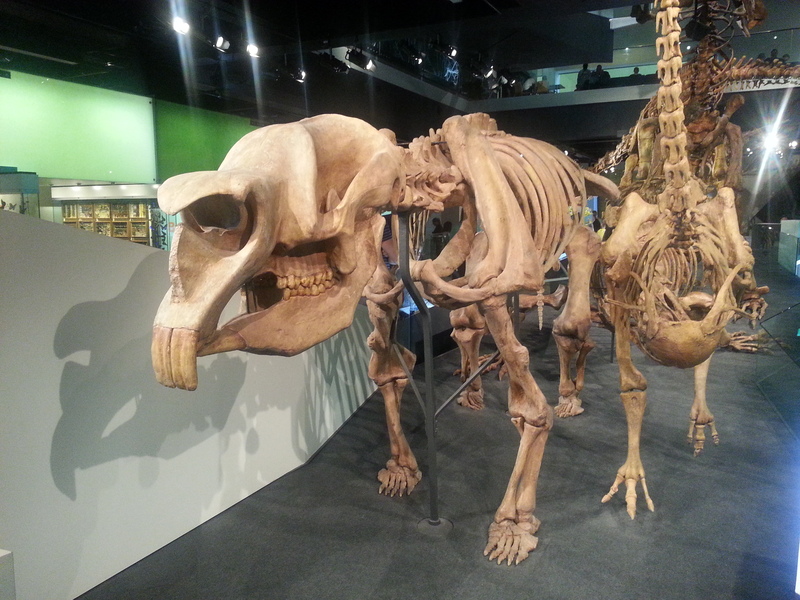 This is a group of Muttaburrasaurus, and they bleat and honk quietly, instinctively hushed. Small waves lap at their feet as they wade out into the river and begin drinking. The Sun has a sharp edge to it and the creatures are lapping noisily, drinking their fill. Clouds of flies harass them. The group has been cautious around this waterway lately for a reason. By the time the group is fleeing the water, braying loudly in a tone of animal panic it’s too late for one of them. A younger individual is flailing, now kicking weakly in the water and sending shock waves up and downstream that will bring curious scavengers like sharks along. As the juvenile dinosaur is pulled beneath the water it sees another member of it’s herd; watching from the bank of the river. See? It’s like a perfect fantasy world. Perfect because it actually existed! 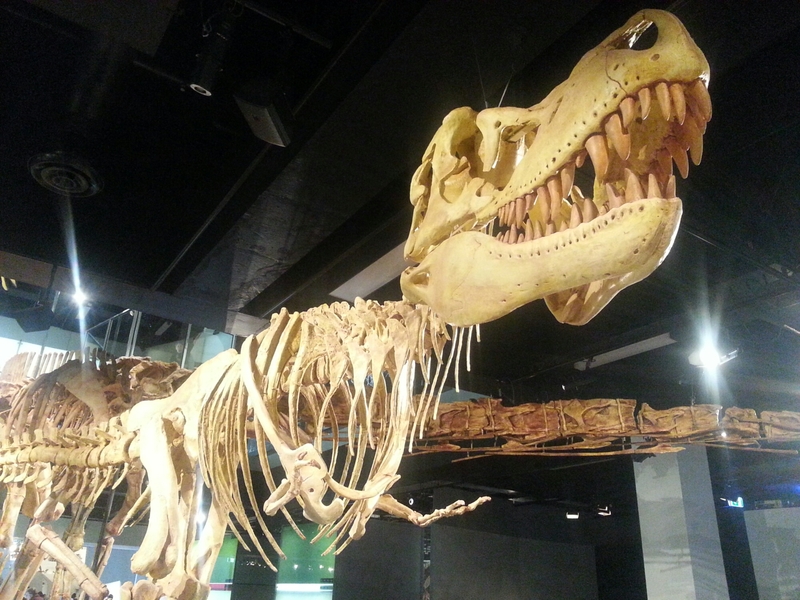 The Dinosaur walk exhibit at the Melbourne Museum allows one to feel this wonder again. It’s school holidays as I write here in Australia. The skeletons are surrounded by throngs of kids (and equally excited parents I would dare say). Could there be some budding scientists in that mix somewhere? Maybe one day a future palaeontologist or biologist will recall this day, remembering how the Tarbosaurus skeleton loomed large, glowering down at them. They might recall a mixture of excitement and wonder that will stay with them their whole lives. 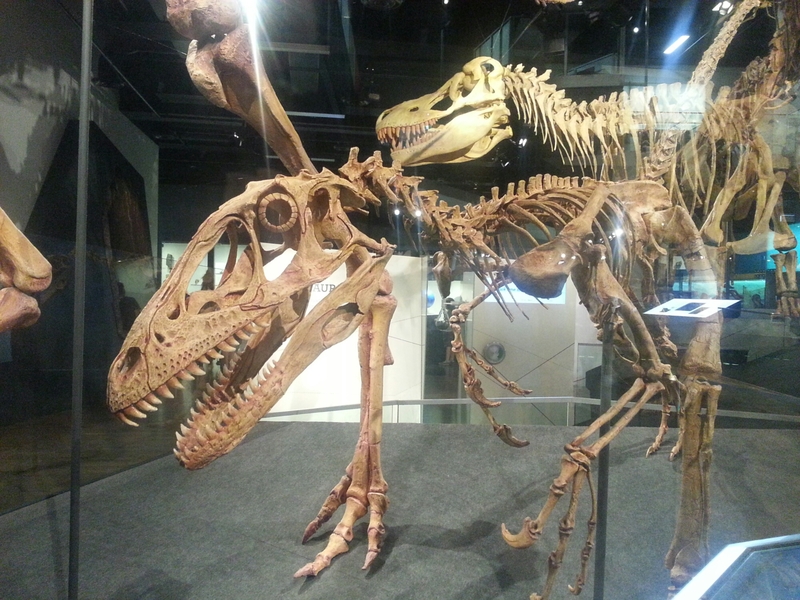 An adolescent Tarbosaurus, smaller cousin to the infamous Tyrranosaurus Rex. I’m surrounded by screens. Phones are out, tablets are pointed at the displays and the museum has touchscreens everywhere, where kids are jostling to interact with the information being presented on them. As seems to be a standard thing these days the children are focusing more on this electronica. I note this and tell myself what my younger self would have seen when looking up at these giants…. A cool wind slides across a vast expanse of sandy bushland, somewhere in what will one day be Mongolia. The time: not really important to the young Tarbosaurus creeping along a dried river bed, eyeing new prey. For the human observers, borne by imagination into this distant past let’s call it approximately 68 million years before palaeontology is even invented. Food is a little scarce out here for the tyrannosaurid. Larger Tarbosaurs in the region have staked their claims, carving out large tracts of territory. The young dinosaur isn’t starving though. 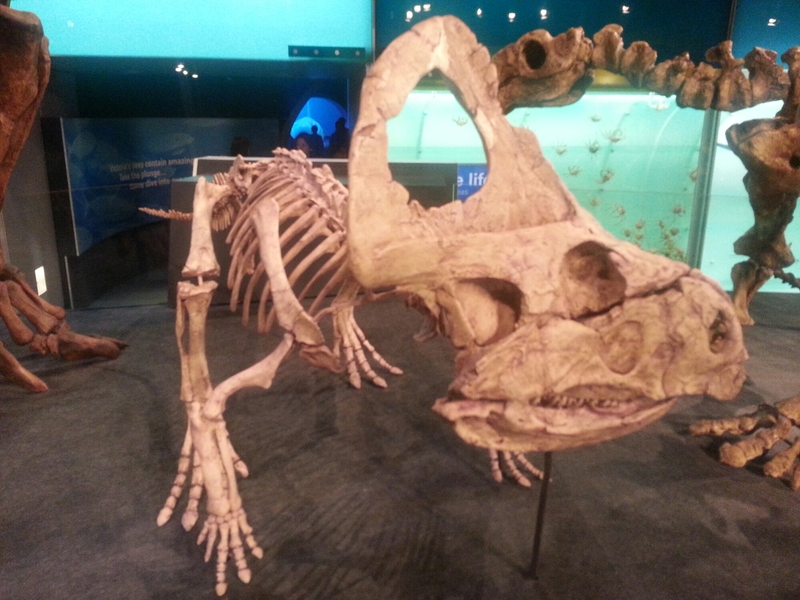 It has discovered these small herds of sheep sized creatures; protoceratops. These are, as their name suggests, ancestors to the tank-like horned dinosaurs of the late Cretaceous: Triceratops, Styraccosaurus and the like. The diminutive reptiles are abundant here, staying in groups where there is safety in numbers. They’re savage little fighters too. Seeping wounds on the Tarbosaur’s lower legs and belly give testament to this. They have discovered strength in numbers. It all happened so fast..
Who knows what has brought these bones all the way across the world to this museum? The lives of these creatures is impossible not to wonder about as I find more skeletons. Not all dinosaurs here hail from overseas. Australian dinosaurs take pride of place. Qantassaurus intrepidus was a small bipedal hypsilophodontid which hailed from what is now-again- modern day Queensland. Along with Dinosaur Cove in Victoria Queensland is becoming a veritable hot bed of fossil discoveries. 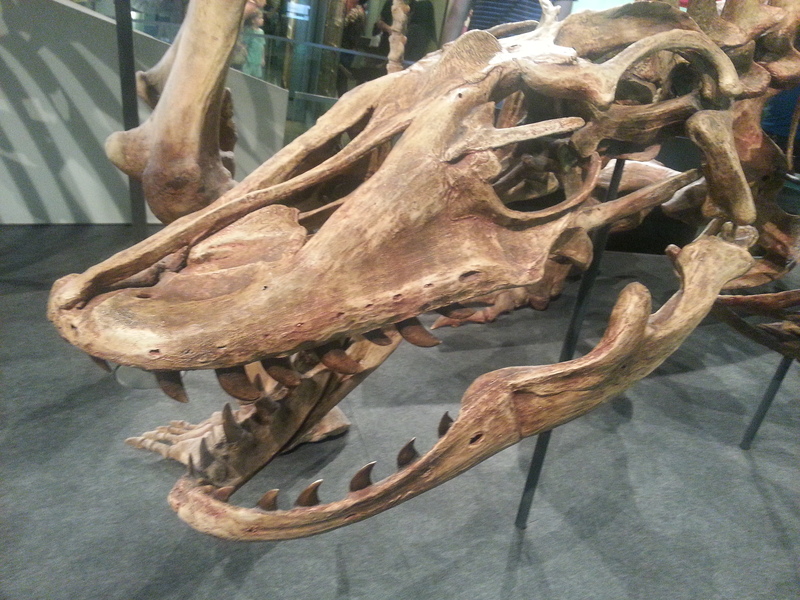 Qantassaurus is interesting in the context of this exhibit because it’s appearance has been almost entirely reconstructed from fragmentary fossilised teeth. It’s morning in Jurassic Queensland. A pair of rabbit sized mammals are squealing noisily, squabbling over the remains of a dog sized reptile . There isn’t much left. Other scavengers have long since picked the carcass to pieces. The combatants snarl and wrestle over a tooth, desperate to claim any prize in this battle. A victor emerges, and the loser scuttles off into surrounding undergrowth, eager to not become prey itself…. A few teeth! From a few teeth (and several educated guesses) palaeontologists are able to glean information: the animal’s lifestyle, diet, and size. Australia, one million years ago, sometime during the Pleistocene Period. Vast red emptiness spans the continental interior. This is a dry, desert continent and life here is tough. A lone predator stalks the deserts and arid grasslands, preying on the megafauna that has evolved here in isolation from the rest of the world. A lizard, looking something like a seven metre long Komodo Dragon stalks the scrappy salt bush that stretches as far as the eye can in all directions. Some day a new predator will arrive here; a bizarre two legged beast that will conquer these lands and seize their place at the top of the food chain. Top of the pile until new competition arrived, Megalania was a true apex predator, stalking Pleistocene Australia. For now, the harsh sun blisters the land but Megalania hides in shadows, eyeing it’s next victim…A pair of Diprotodon grazes on some nearby bushes. They are too intent on their meal. These giant marsupials are the ancient Australian equivalent of the rhinoceros, filling the same ecological niche. Diprotodon, along with all other Australian megafauna died out circa 46000 years ago; a victim of climate change and human predation. The Diprotodon aren’t fast movers at the best of times, relying mainly on their size as a means of warding off predators. The youngster, however, is brought down quickly as the ancient reptile dashes out with a freakish burst of speed. The mother is equipped with a fearsome pair of incisors. Normally she uses it to extract roots and vegetation from the dry red soil. Megalania is rewarded with a broken foot as it is trampled by an enraged mother weighing several tonnes. Those teeth inflict a bloody toll as well, and the defeated predator is forced to retreat, slinking quickly back into the scrub…. 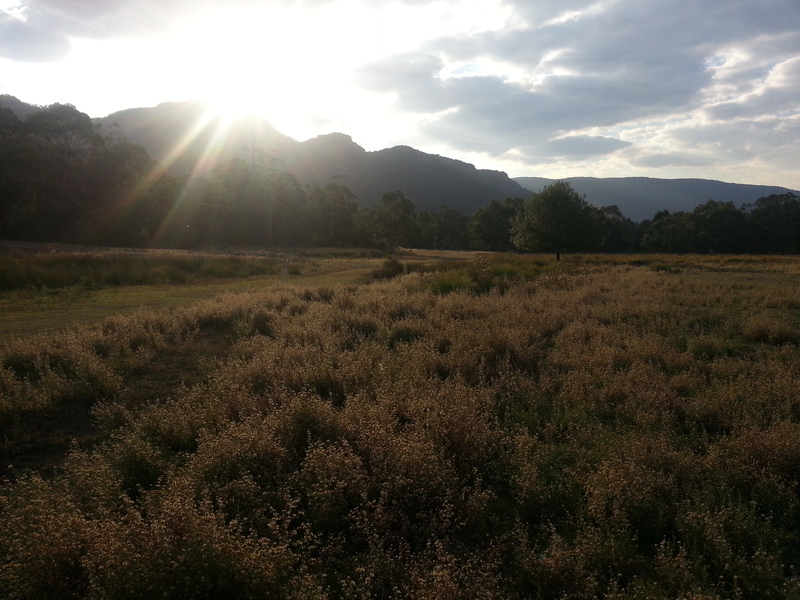 For 380 million years the vast slab like Grampians have dominated the Victorian landscape. I can almost smell these long lost landscapes. I can stand on the cusp of a red dune, watching whirly-whirlies (dust devils) skipping across the endlessness of an inland sand sea. Where I stand in this dream scape was once the floor of an ocean: the Eromanga Sea. Imagine looking up from this spot, protected by the vast lengths of time between yourself and seeing elasmosaurs; graceful long necked giants gliding through the waters. There are more posts to come on the very ancient world, and Australia in particular. I would love to hear other people’s dinosaur tales. I don’t think a half baked youtube video can do justice to these prehistoric beasts and their memory as much as the written word. Anyone can feel free to offer suggestions or their own experience growing up in the imaginary shadow of dinosaurs and the prehistoric world.